We’re now in Week 13 of the NFL season. To help prepare, here’s my weekly look at the top starts and sits for fantasy football players in IDP leagues. With Week 13 upon us, hopefully IDP owners find themselves in one of three scenarios. The playoffs are beginning and their team is participating, or their team is competing this week to make the playoffs in the final week of the fantasy regular season, or lastly, their team is looking to improve their playoff seeding. On a side note, if your team is out of playoff contention and still has a regular-season game remaining, please set a lineup. Another owner may need the help and it’s the right thing to do. Off the soapbox, and on to the Week 13 IDP start/sit selections. In the Week 11 shootout with the Chiefs, Suh had a surprisingly down performance, failing to register single quarterback pressure as teammate Aaron Donald did the damage with a pair of strip sacks. For the 2018 season, Suh has been credited with 35 total quarterback pressures and has a great Week 13 matchup. In the last five games the Lions have allowed 14 sacks to defensive linemen along with 69 total tackles, a forced fumble, and two fumble recoveries. Suh put up nine total tackles against the Seahawks in Week 10 and should post similar stats this week while also having splash-play potential. The veteran Jordan is heating up at the right time for IDP owners after a stretch in Weeks 7-9 that saw him post just seven total tackles and no splash plays. In the past three games Jordan has put up three sacks including the two he posted in New Orleans Week 12 win over the Falcons. He has been credited with 10 total quarterback pressures in the past two games and has a favorable matchup this week at Dallas. The Cowboys gave up two sacks to Washington defensive linemen last week and may be without Tyron Smith, who is dealing with a neck injury. Defensive linemen have accounted for 10 sacks against Dallas over the last four games and Jordan should have a big Thursday night performance. It’s been a disappointing season for Ngakoue after a 2017 campaign in which he posted 12 sacks along with another 10 splash plays including a touchdown. Through 11 games in 2018, Ngakoue has just six sacks with 15 total tackles and no other splash plays. This is not a matchup to jump start his season as the Colts have been protecting Andrew Luck very impressively over the last five games. In that time, Luck has been sacked just once. In the Week 10 meeting against the Colts, Ngakoue put up a 1/1/2 stat line. It’s time to move on from the boom-or-bust (mostly bust in 2018) Ngakoue. Since returning to the team, Griffen has managed to post 2.5 sacks in four games. Unfortunately, the tackle numbers have not been there as he has managed just six total in that time. Just two weeks ago, Griffen put up a goose egg and failed to register a quarterback pressure against Chicago. Over the last four games the Patriots have been a tough matchup for defensive linemen. They have allowed an average of 10 total tackles per game and one sack to the position in that time. It’s safe to sit Griffen this week in a negative matchup. Even with Leonard Fournette suspended for fighting, it’s a safe bet that the Jaguars will look to run the ball plenty with Cody Kessler taking over at quarterback. Over the past four games, the Jaguars have been a positive matchup for opposing linebackers, allowing an average of 24 tackles per game to the position. In that time linebackers have also put up 5.5 sacks, an interception, and two forced fumbles against a struggling Jacksonville offense. Walker finished with double-digit tackles in the Week 10 meeting between the teams and should repeat that feat in Week 13. In Week 11, Schobert played 68% of the defensive snaps in his return from a hamstring injury and finished with seven total tackles. Last week he finished with eight total tackles but more importantly played 100% of the snaps. This week, Schobert has a juicy matchup against a Texans offense that has been among the most generous to linebackers over the last four games. Houston has allowed 102 total tackles to linebackers over that time and averaged 33 rush attempts per game. Houston has also allowed 4.5 sacks and five other splash plays to linebackers in those games. It’s a good move to pick up Hodges off the waiver wire as reports are that he will now call out the defensive plays with Josh Bynes (thumb) out for the season. After Bynes went down last week, Hodges put up a 7/3/10 stat line playing 46 snaps. But while he’s a must-add, this is not a week to roll Hodges out in a tough matchup. Through 11 games the Packers are allowing an average of just 17 tackles per game to linebackers and only once has reached double-digit tackles against them in 2018. In his second season, Reddick has just not been performing for fantasy purposes. Over the past four games, Reddick has just 17 total despite playing 96% of the defensive snaps. The Week 13 matchup is a tough one to see Burfict jump-starting what has been a disappointing 2018 season for the veteran. The Broncos have allowed just one linebacker to reach double-digit tackles against them this season and have been especially stingy over the past four games. In those games, linebackers are averaging only 16 tackles per game against Denver. Burfict has failed to top eight total tackles in a game this season and has yet to post a splash play. There are better options out there at this critical point in the fantasy season. Short-and-sweet special of the week. 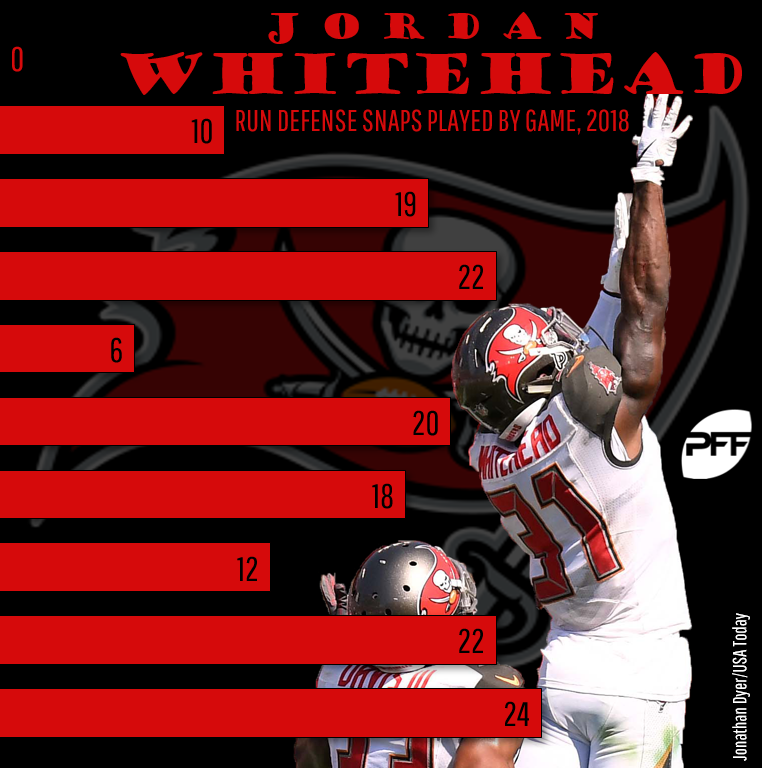 With linebackers Kwon Alexander and Lavonte David out, Whitehead has lined up in the box or on the line 53 times in the last two games. In those games, Whitehead has posted 17 solo and 19 total tackles. Look for another big week from the Buccaneers strong safety playing behind the depleted Tampa Bay linebacker corps. The veteran safety had a big Week 12 performance in the Eagles’ come-from-behind win against the Giants putting up six total tackles with an interception and forced fumble. Over the past three weeks Jenkins has been posting top five fantasy numbers with 22 (17 solo) total tackles, two forced fumbles and an interception. There will be plenty of opportunity for splash play production in Week 13 as Colt McCoy targeted Washington tight ends 12 times last week and had three interceptions. Week 13 is no time to go stat-chasing after Howard put up two interceptions last week. In the four games prior Howard had a total of 16 tackles and no splash plays. The Bills present a tough matchup for Howard considering that Josh Allen hasn’t attempted 20 passes in his last three games. In those games the Bills have averaged 35 rush attempts per game. There will not be enough opportunities for production this week for Howard to have a repeat performance. The fall from fantasy grace continues for Boston as he just hasn’t played the same since returning from a shoulder and rib injuries. On the season Boston is sitting in DB2 territory but a closer look reveals that over the past three games he’s sitting outside the top 60 in balanced-scoring systems. In those games Boston has managed just 15 total tackles and hasn’t posted a splash play. It’s time to move on.